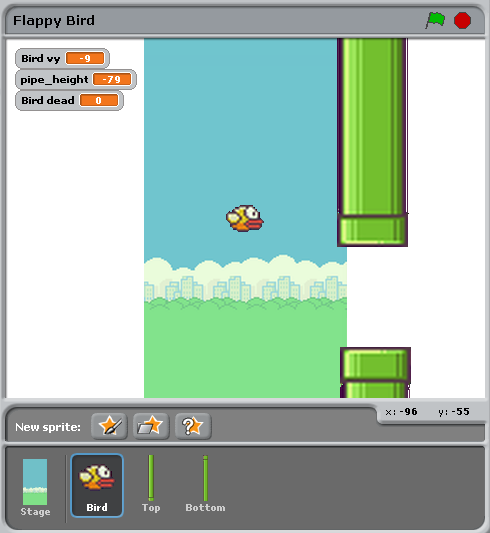 This tutorial will compare an implementation of Flappy Bird written in Scratch with one written in Pygame Zero. The Scratch and Pygame Zero programs are similar to a remarkable extent. The Pygame Zero version can be found in Pygame Zero repository. You can also download the Scratch version from the repository. The Pygame Zero version includes scoring logic, which is omitted in the code examples on this page to make it a closer comparison. The Python code shown below is re-arranged for clarity within the examples. There are just three objects, aside from the background: the bird, and the top and bottom pipes. The pipes move at a constant rate irrespective of the bird. When they move off the left-hand side of the screen, they loop around to the right, and their vertical position moves at random. 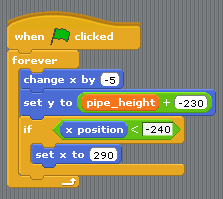 In Scratch this can be achieved by creating two different scripts for the top and bottom pipe. The condition x position < -240 is true when a pipe is off the left-hand side of the screen, and this is the trigger to reset the pipes. The pipe_height variable is used to coordinate the two pipes. Because the gap between them should remain the same, we can’t pick both heights randomly. Therefore one of the scripts has this logic and the other doesn’t. The set y position to pipe height +/- 230 sets one pipe to be above pipe_height and the other pipe below pipe_height. A small difference here is that I can extract values that I want to re-use as “constants”, spelled in UPPERCASE. This lets me change them in one place when I want to tune the game. 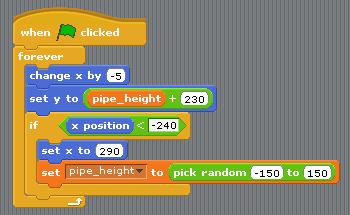 For example, in the code above, I could widen or narrow the gap between the two pipes simply by changing GAP. The biggest thing that differs is that there is no forever loop in Python code. This is the big difference between Scratch and most text-based programming languages: you must update the game by one animation step and then return. Returning gives Pygame Zero a chance to do things like processing input or redrawing the screen. Loop forever and the game would just sit there, so any loops need to finish quickly. 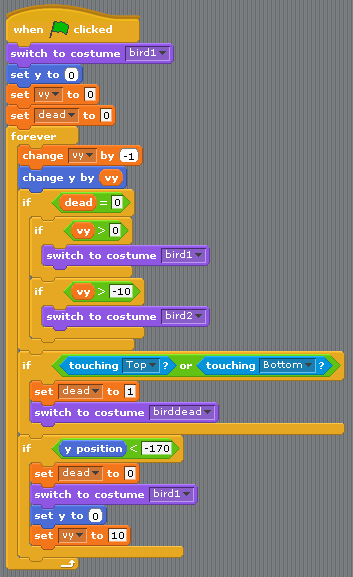 The patterns described above for how Scratch logic translates to Python code also apply for the bird logic. Let’s look at the Python code first this time. Gravity means constant acceleration downwards. Velocity is change in position. To represent this we need to track a variable bird.vy, which is the bird’s velocity in the y direction. This is a new variable that we are defining, not something that Pygame Zero provides for us. Gravity means constant acceleration downwards: GRAVITY is greater than 0. Note that the bird does not move horizontally! Its x position stays at 75 through the whole game. We simulate movement by moving the pipes towards it. This looks as though it’s a moving camera following the bird. So there’s no need for a vx variable in this game. This checks if the bird is moving upwards or downwards. We show the bird2 image if it is moving upwards fast and the bird1 image otherwise. (-3 was picked by trial and error to make this look convincing). If so we set bird.dead to True. This is a boolean value meaning it is either True or False. We can use this to easily check if the bird is alive. If it isn’t alive it won’t respond to player input. What’s reset_pipes() doing there? Because I’d organised my pipes code to be a separate function, I can just call it whenever I want to reset my walls. In this case it makes it a better game because it gives the player a chance to react when the bird moves back to its start position. Here, if the bird is not dead, we set its vy to a negative number: in Pygame Zero this means it starts moving upwards. You cannot loop forever in Pygame Zero - just update for one frame and then return. The coordinates are different. In Pygame Zero, the top left of the screen is x = 0, y = 0. The x direction goes from left to right as before, but y goes down the screen! This is why GRAVITY is a positive number and FLAP_VELOCITY is a negative number in Python. bird.dead is a bool, so I can write code like if not bird.dead instead of dead = 0 as in Scratch. Many of the concepts available in Scratch can be translated directly into Pygame Zero. When Flag clicked… forever Put code into the update() function. In some cases, the code is simpler in Python because it can be organised in a way that helps it make sense when you read it. The power of Pygame Zero’s actors also makes the coordinate manipulation easier. We used the anchor position to position the pipes, and we were able to see if a pipe was off-screen by checking pipe_top.right < 0 rather than if x position < -240.